Update: the date will change on this post to keep it on top until the awards; scroll down for new posts. 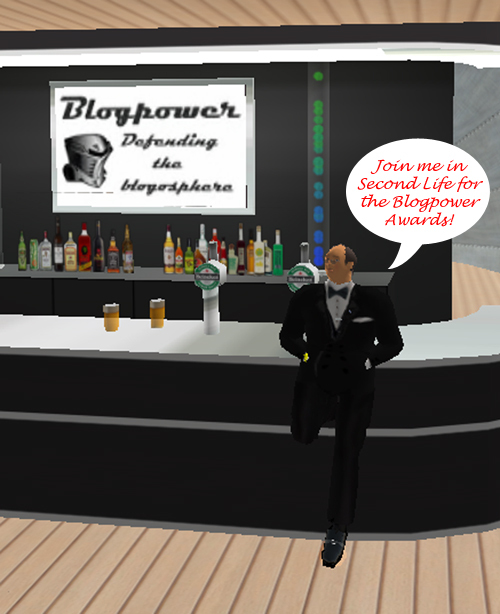 It has been remiss of me not to plug the upcoming Blogpower awards to be hosted by Tom Paine in SL (second life). Global warming got you burnt up? Can't stand the rain in London? Never fear, SL is here. Follow the link to join us at the awards ceremony on July 1st, 2007 at 2pm (1400) London time (that's 9am New York) at Tom's fantastic location. Feel free to enter early (to get acclimated if you're unfamiliar) and you can get a free account at the link above (if needed, you only have to pay if you want to own land). Many thanks to Tom for doing this, we hope to see all the BP'ers out there (and anyone else who wants to stop by).